This is my take on strawberry shortcake. I love strawberries, but place them in a traditional strawberry shortcake recipe and I don’t really care so much for them. I think that the strawberry sauce with its syrup is too sugary sweet for my liking. The shortcake is another thing I don’t like either. A homemade shortcake tastes like it has too much of something in it. Maybe baking powder? Then when it is topped with whipped cream, that does it for me. Just too much sweetness. I guess I don’t really strawberry shortcake on second thought. So I wanted to create my take on traditional strawberry shortcake that takes all the sugar and sweetness out of it. I want sugar, don’t get me wrong, but I also want it to have a little kick as well. Something that plays off the tongue. 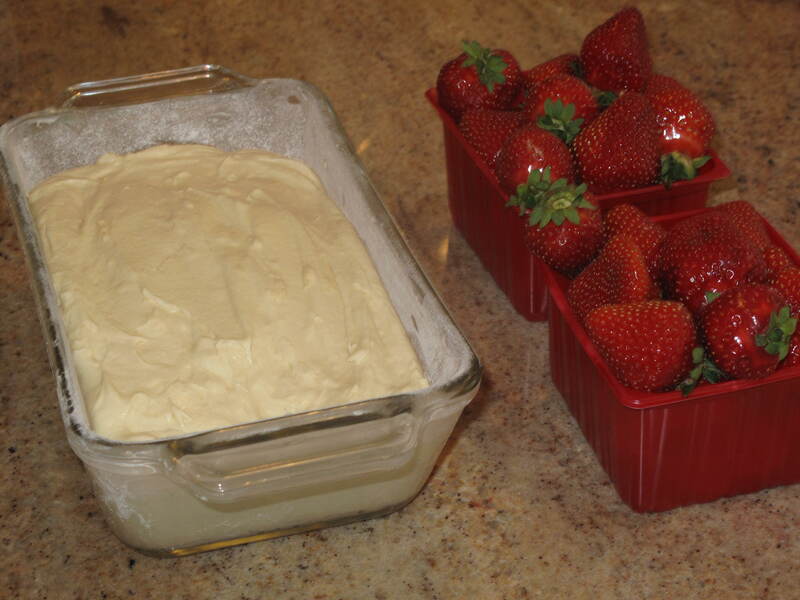 So this is my non-traditional strawberry shortcake recipe that uses a honey vanilla pound cake and balsamic strawberries. Preheat the oven to 350 degrees. Grease the bottom of an 8 1/2 x 4 1/2 x 2 1/2-inch loaf pan. Line the bottom with parchment paper, then grease and flour the pan. In the bowl of an electric mixer fitted with the paddle attachment, cream the butter and sugar on medium speed for 3 to 4 minutes, until light. 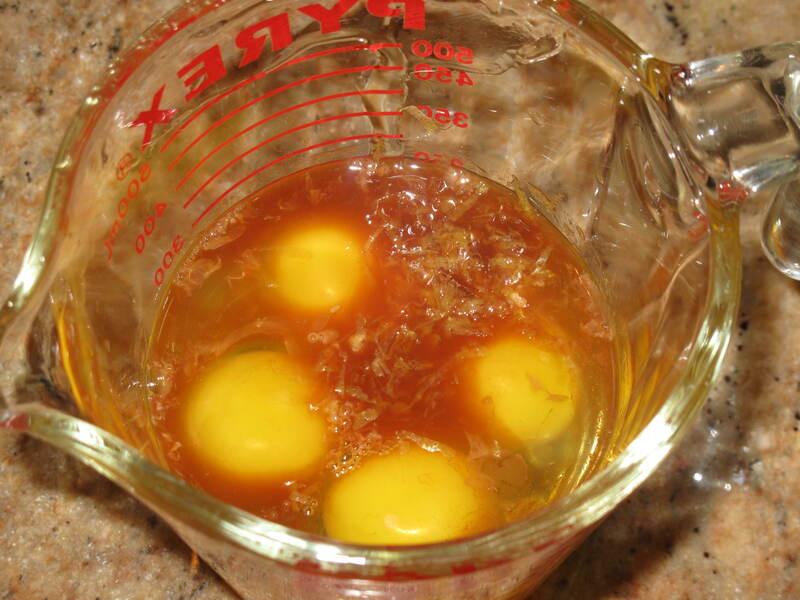 Meanwhile, put the eggs, honey, vanilla and lemon zest in a glass measuring cup but do not combine. With the mixer on medium-low speed, add the egg mixture, one egg at a time, scraping down the bowl and allowing each egg to become incorporated before adding the next egg. Sift together the flour, salt and baking powder. With the mixer on low-speed, add it slowly to the batter until just combined. Finish mixing the batter with a rubber spatula and pour it into the prepared pan. Smooth the top. Bake for 50 to 60 minutes, until a toothpick inserted in the center comes out clean. Cool for 15 minutes, turn out onto a baking rack and cool completely. 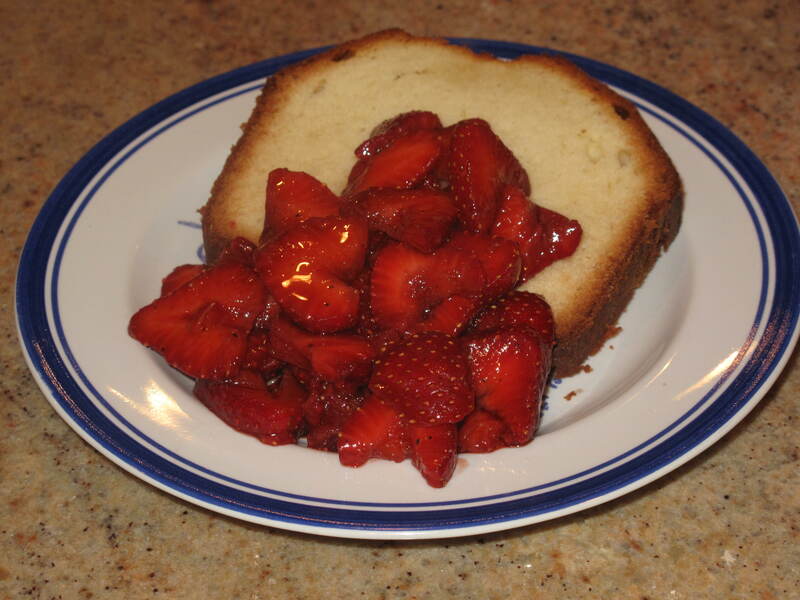 About 30 minutes before you are going to serve the pound cake, take the sliced strawberries and mix with the balsamic vinegar, sugar and ground black pepper. Stir to mix all ingredients. Cover and place back in the refrigerator to chill and blend flavors. 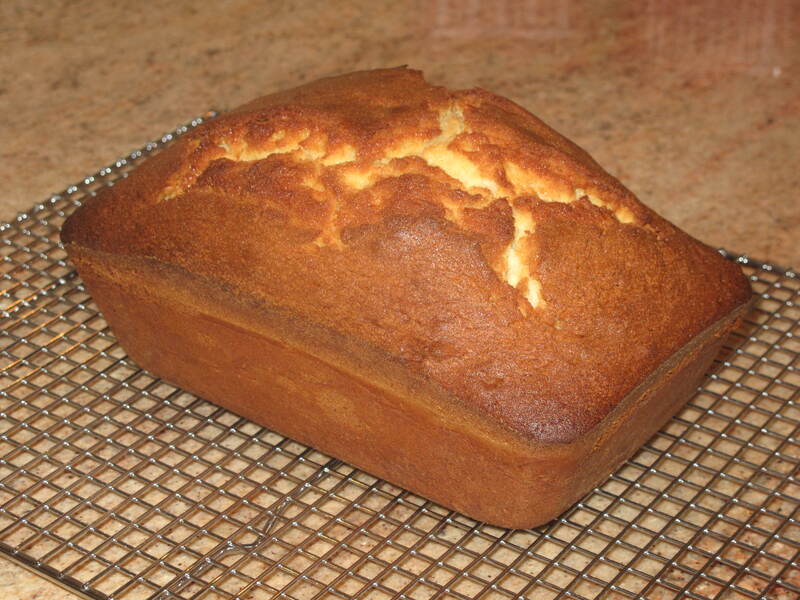 Cut the cake and place an appropriate amount of strawberries over the pound cake. There you have it. My non-traditional strawberry shortcake. Even though it’s not my speed, a little whipped cream on top would be pretty good too if you choose. It’s your choice. 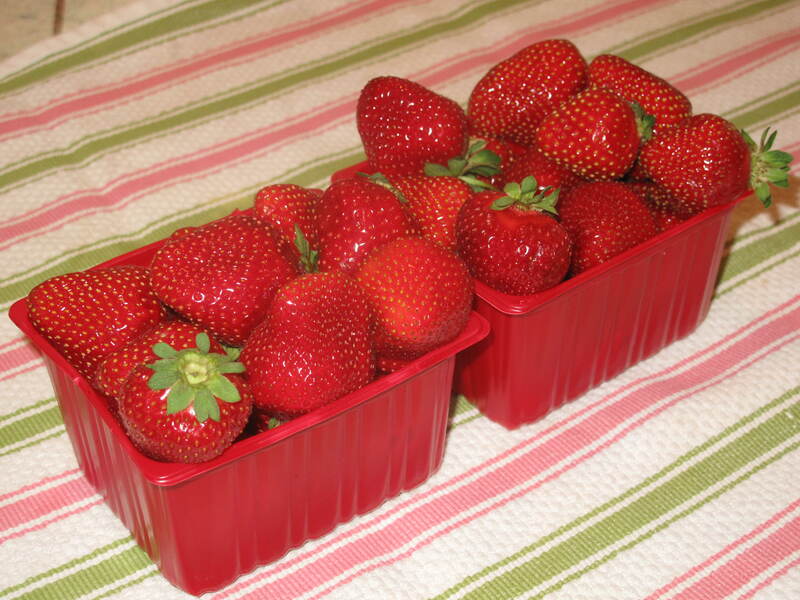 We were so lucky to get some great strawberries at the farmer’s market. Very fresh and pesticide free which is always nice to have. Farmer’s markets seem to be everywhere these days so take a trip to your local one and pick up some great fruits and vegetables. It may cost a little more but the flavor boost is worth it. What strawberry recipes do you like that you could share on Acorns On Glen? This entry was posted in Food and tagged Acorns, Baking, Beauty, Blog, Cooking, Dessert, Family, Food, Fun, Life, Lifestyle, Love, My Life, Opinion, Photos, Recipes, Summer, Thoughts. Bookmark the permalink. I really like this take. The balsamic and simple cake would pair well. Makes it all about the berries. We did a post of simple strawberry desserts earlier this year, one of them was simply basil and balsamic. Seems so long since we’ve had strawberries. Thanks for the comment. I was able to get strawberries up through last week, but with all this heat, I think those days are over. Looks like it might rain today so that will help. Come back and visit soon. I don’t have any receipes to share but your cake looks and sounds delicious. We were suppose to get rid of our heat wave but it is back with a vengence. The humidity is horrid. So lay back in your hammock and have a piece of strawberry cake. Thanks for your comment Carolkin. Too hot to even lay in the hammock. I like recipes that are not too sweet or complicated. Your strawberries and cake sound nice. Hi Karen. Thanks for your comment. I liked this recipe a lot. I absolutely will make it again. I don’t share your dislike of shortcake, could be a childhood thing, but do agree that strawberries and pound cake are wonderful together. Thanks for your comment. Was really tasty and different. Nice change of pace.